I am inspired about an upcoming trip to go and view some property in a neighboring city where land/building prices are low and the square footage is high! Lee and I have decided a move is in the cards this year and are looking for a bigger space to live and work out of. 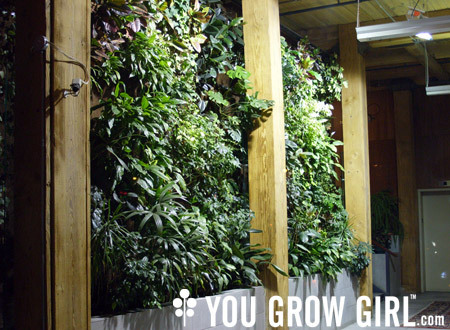 We were sitting in an inspiring space the other night and started dreaming about how we see our space come to reality. 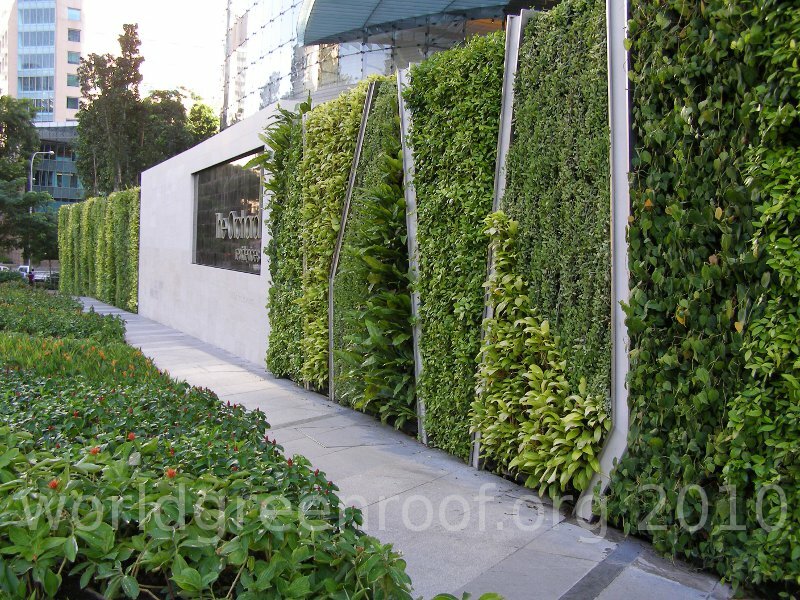 I brought up the idea of including a green (living) wall. I was first inspired by this during a trip Lee planned on Valentines day to the Royal Botanical Gardens just outside of Toronto. The air was fresh and we both commented about how the environment made us feel better than usual, similar to the feeling of an oxygen bar. 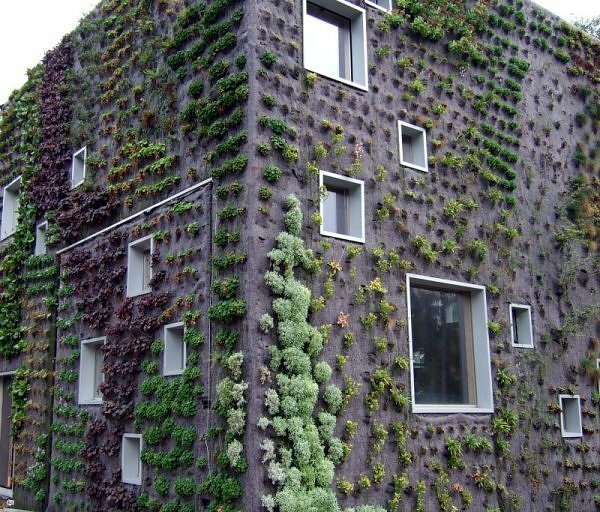 Later during a field trip in University my c lass made our way around the city looking at green roofs and living walls. 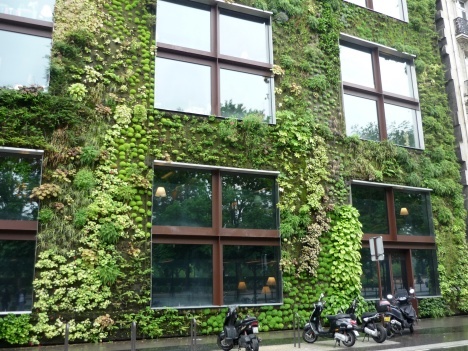 Specifically the Centre for Social Innovation stuck in my mind ever since – but I can still remember seeing the green wall upon entrance to this old converted loft space. Not huge in size, but impressive none the less. The smell knocks you in the face and it is such a quiet, warm space that you just want to linger. The plants against the wood is such a beautiful contrast. A few years later I was at the Cambridge City Hall. If you ever have the chance – go visit. 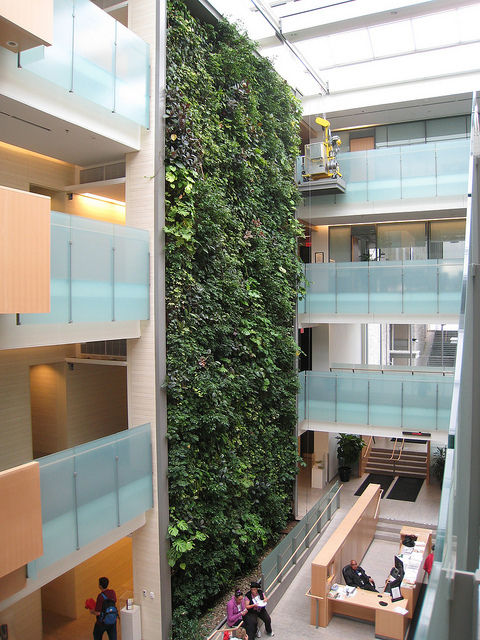 It is beautiful, open and has a GIANT living wall that circulates the air. 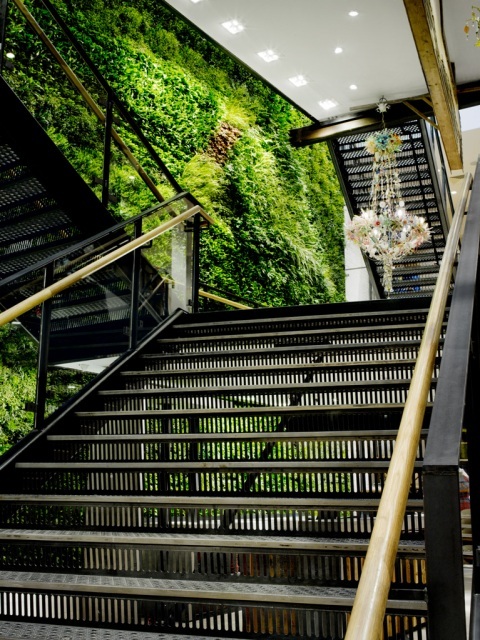 This building has earned a gold for LEED certification. Go Cambridge! 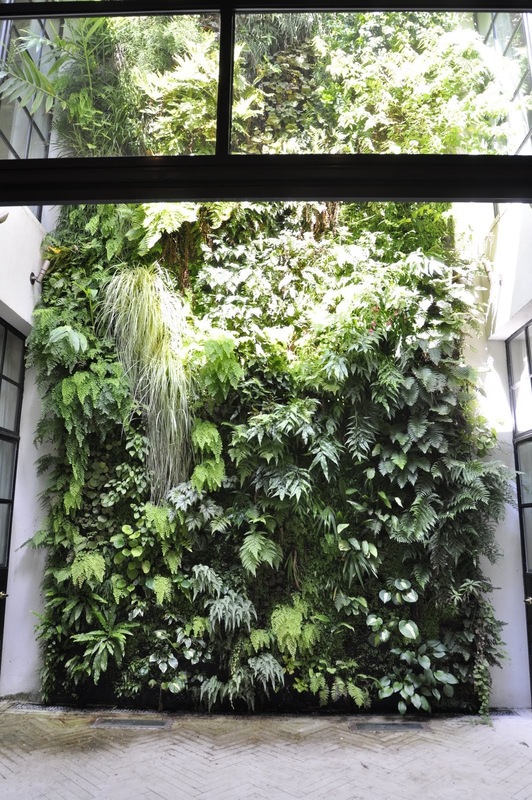 I am constantly dreaming about a green wall and decided to look into it further in order to make it a reality when we find our studio space. 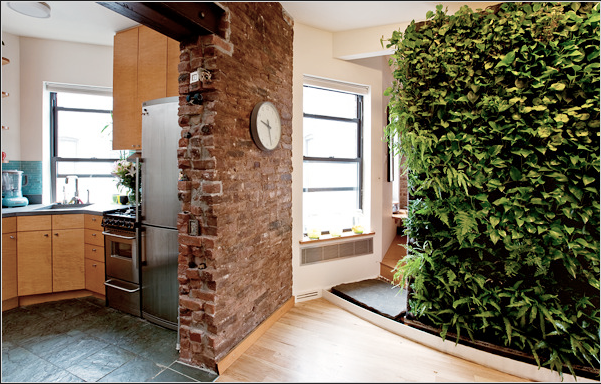 I have compiled a few images of walls that are interesting and realize I need to do a lot more research about how to build and maintain a wall. (not to mention save my $$) I can see this being an area I would like to study more and potentially go towards in my design career. I hope these pictures spur some ideas of your own! The follow are shots of exteriors I thought were pretty cool! It is a really neat idea that you can watch your exterior change over time (filling in). I like that you can put different plants in spots to create an interesting pattern. I am not a huge fan of the bald spots, but that is my impatience speaking. It is in general a beautiful process. The scale of large wood windows creates a very warm approachable feel. I would have liked to have seen street furniture in this shot. 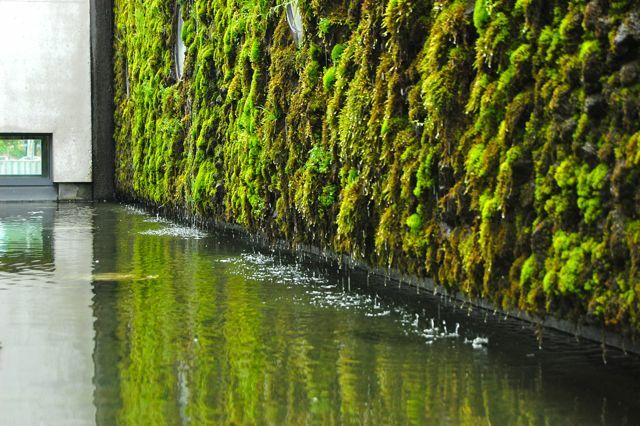 This is from Iceland – MOSS -can’t get enough!!! The moss is growing over a volcanic rock. How meditative. This is my idea of a statement piece in your home. 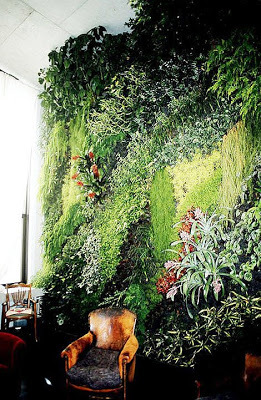 I would love a green wall as my living room backdrop! 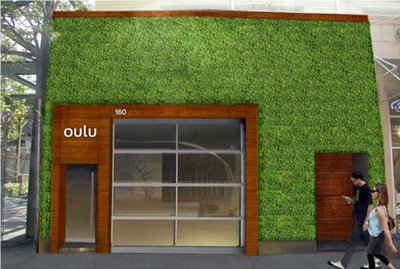 Great for a retail store – I have seen this done by brands like West Elm, Lole & Underarmour. Another beautiful backdrop with the wood bench contrast. 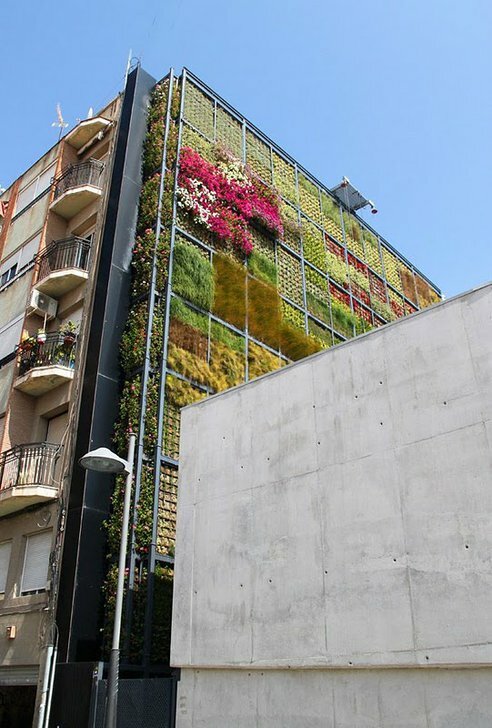 A huge scale project – reminds me of shipping containers. 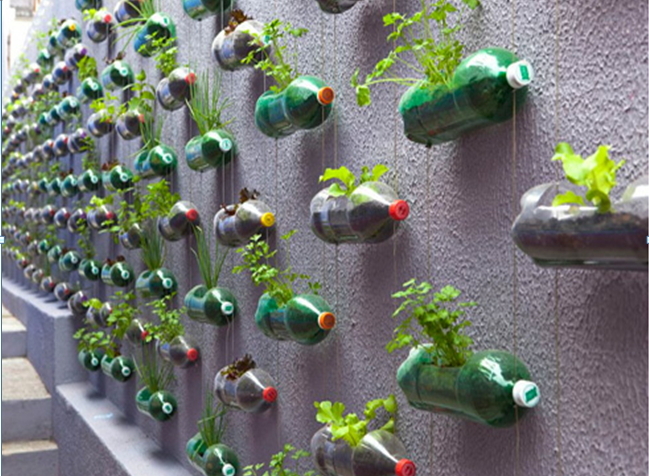 I would love to see this in random places here in Toronto – like the alley ways behind the shops on Queen street. 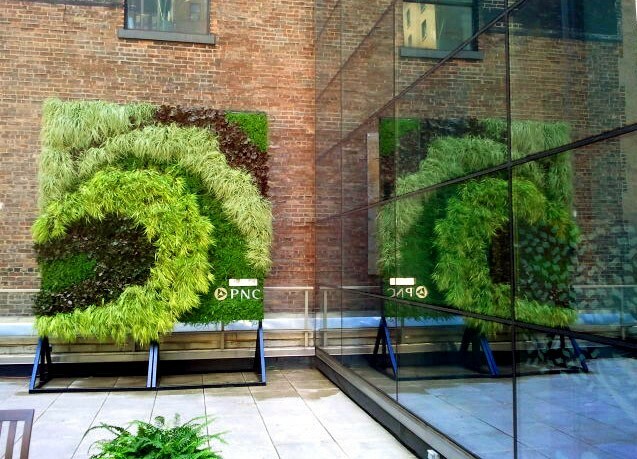 The separation of space is interesting – you could do some interesting artwork with living walls. 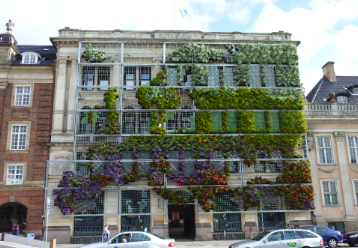 The colour is stunning – I love that they covered an architecturally rich existing building. Imagine a whole bunch of these scattered on a huge wall? 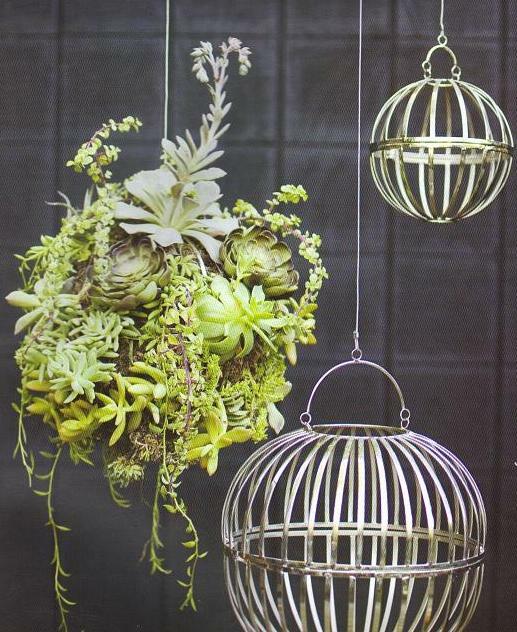 I love succulents – they are really hard to kill – win -win! This is interesting and unappealing to me- I am not a fan of stairs and I feel like the wall would grow out into the staircase and it would limit the space you have getting up and down. Maybe I am over thinking this. 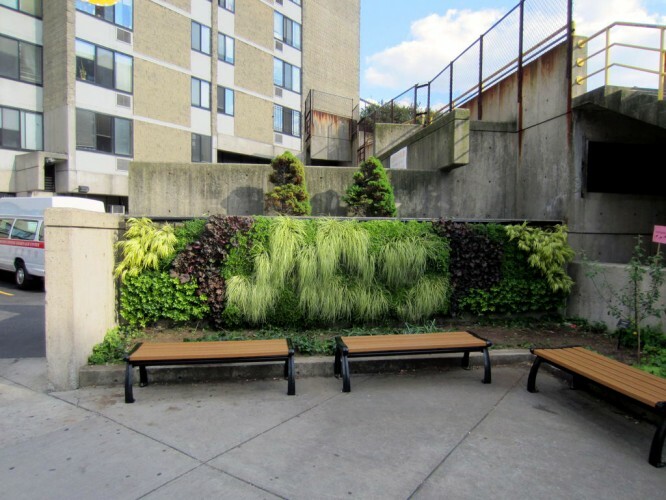 This person created a “Partick Blanc” styled wall – he is a pioneer of the living wall. 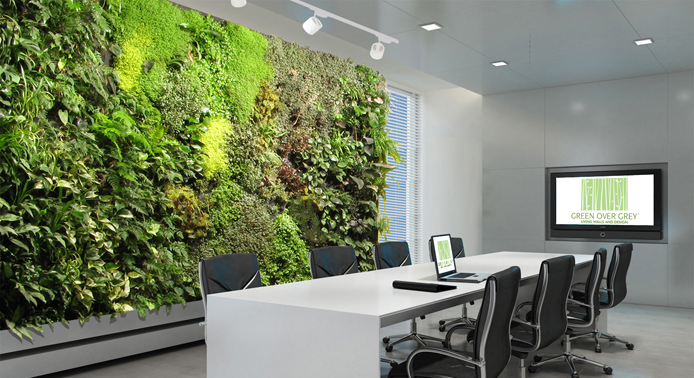 I would love to work in an office with a living wall – I be more alert and fall asleep less…ha! 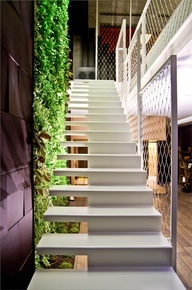 I like the metal wood an plant combo in this pic. Industrial chic – modern. LOVE IT. I love the scale of these really large walls! How cute are these? 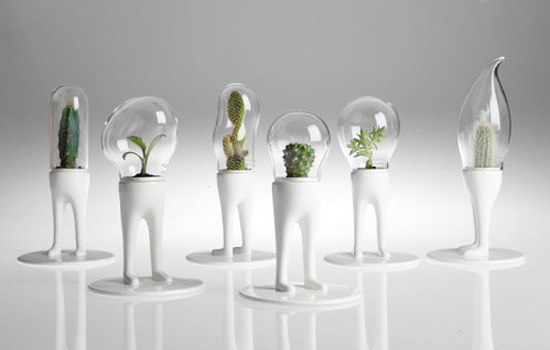 Plants are ALIVE… humanizing them is super cute. Maybe staggering them so it creates an artistic display. 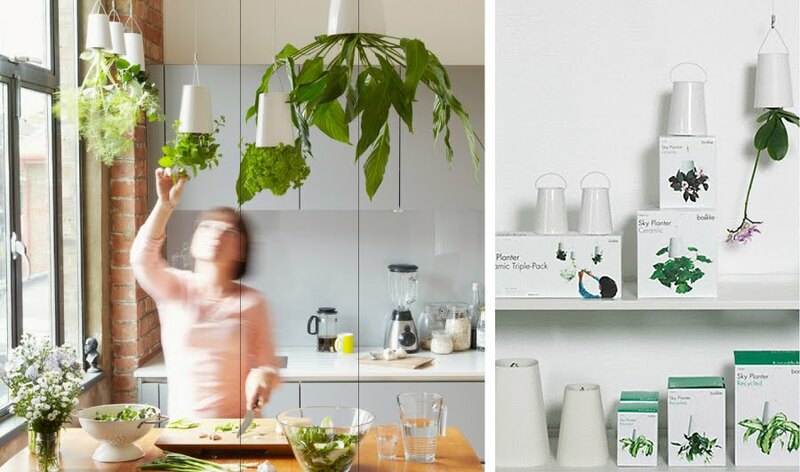 Plants used as screens – movable? YES please! These are really pretty – I might get a few and practice. 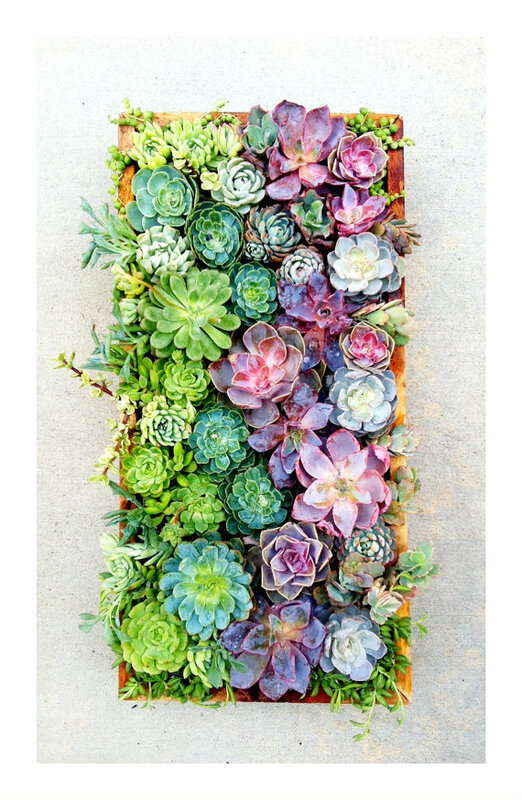 Again – loving the succulents! 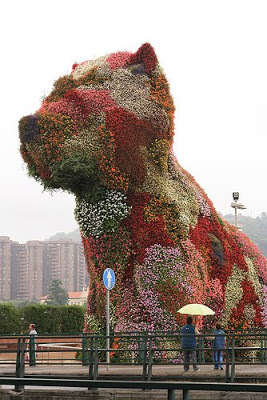 Last but not least – an ode to my dog Cookie – The dog garden!!!! WOOF!